Here is a cowl with the cozy, fashionable look of chunky yarn but without the uncomfortable bulk that often accompanies it. 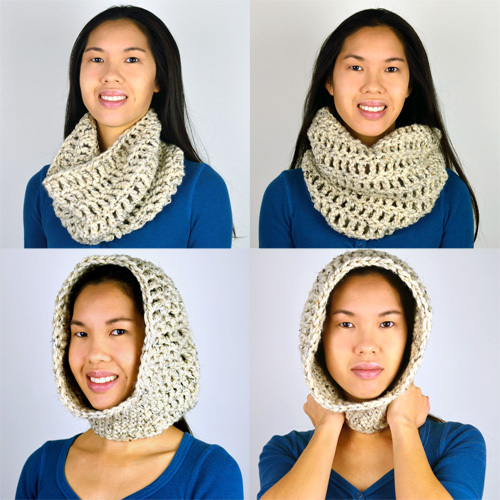 Designed with a high and a low end, this cowl fits just right around the neck. The high end is tall enough to be worn like a hood, while the low end sits comfortably under the chin. Rotate the cowl and wear the high end in the front and the low end in the back to create a nicely draped, classic cowl but without the bunching in the back. This entry was posted on Sunday, November 27th, 2016 at 10:35 AM by Rachel Choi	and is filed under Best Crochet Patterns. You can follow any responses to this entry through the RSS 2.0 feed. You can skip to the end and leave a response. Pinging is currently not allowed.